Much of our religious consciousness is affected by art; we have inherited specific images that are more artistic than biblical. For example, we always imagine St. Paul being knocked from a horse on the Damascus Road. There is no mention of the horse in scripture. Is that a bid deal? Perhaps not. But when Caravaggio placed Paul on the horse, a sign of privilege or royalty, he removed Paul from the midst of Corinth, the hard-scrabbled sea port town, from among the drunks, slackards, ner-do-wells, and people who sorely needed salvation.I think art has also done that to the image of Mary. Many of the paintings that illustrate the Assumption of Mary into heaven, show Mary floating upward on a cloud, carried away by angels and accompanied by cherubs. She hasn’t aged a day. Her hands are folded quietly, her eyes rolled up to heaven, her ties with earth—and with us—almost completely severed. In these paintings, the people standing below look up at her with longing and with love, reaching out to grasp her robe or touch her feet—But it is too late. Mary has already left them behind – left us behind. As exquisite as these portraits can be, they can also feel distant, generic, abstract. In these paintings, Mary is our mother, yes, but a remote one—who shows not trace of the life she lead, the sorrow of her son crucified, who knew pain, needs, dreamt, and longed for God. The Mary of the paintings is one who now seems to be untouched by our pain; unaffected by our need, unaware of our dreams. They are lovely images—but somehow unsatisfying. Glorious—perhaps a little unnerving. It’s as if the record of her bold and faithful life has been wiped clean and replaced with something tame and secure. It’s as if the cosmic “YES” that exploded time and enfleshed the Word has been muted, dimmed, softened into a something vague and remote. 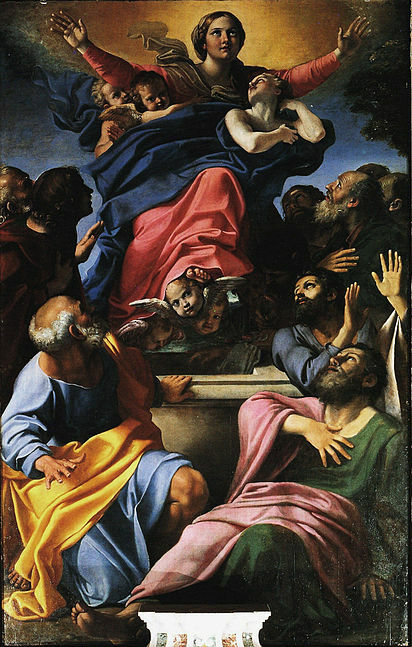 But there is another painting—a painting of the Assumption by Annibale Carracci that hangs in Santa Maria del Populo in Rome – interestingly, not too far from Caravaggio’s painting of St. Paul. In this painting, Mary looks different, somehow. Like the brave women who first travelled across the unbroken wilderness to visit Elizabeth, Mary has a clear gaze and a keen eye. She looks straight ahead into a horizon that we cannot yet see. She has the look of a woman who has studied the way and has learned every rock in the path, every twist of the road. She has the look of a woman who knows that despite the perils of the journey, she will arrive safe and secure. Her arms are outspread like wings in flight – not to be carried away, but in her generous span, she embraces others—carrying them along, rather than being carried herself. A youth gazes at her face in awe, but her own eyes remain fixed on her destination…and ours. In this painting I see Mary our Mother. She is our guide—our mentor our advocate and our friend. This is a woman we can trust. Her life can become a model for our own. We may never face her challenges, but we can respond to our own with her courage. We may never suffer her losses, but we can meet our own with her strength. God may not ask of us what He asked of Mary, but our “yes” can resonate just as firmly, and where she has gone, we can go too. This painting, with its strong figures reminds me that perhaps we too easily settle for Mary as an abstraction, too easily satisfied with pious clichés and images. There is nothing abstract about the teenage girl who said “Yes” to the great mystery of the Incarnation. There is nothing abstract about the mother who fled with her family to Egypt to escape Herod’s infanticide. There is nothing abstract about the panic that seized her when she thought the child Jesus was lost in Jerusalem. Nothing abstract about her quiet confidence at the wedding in Cana – This is my Son. Do what he tells you — as good spiritual advise as you will ever find. This is a real, faithful woman who endured the growing threats against her son, witnessed his scouring and his crucifixion – not from afar – but at the foot of the cross. Fortunately for us, the Church teaches that our Mary is no abstraction. She is as real as the woman Carracci painted over 400 years ago. Her robes are generous enough to enfold us. Her vision is keen enough to guide us. Her heart is big enough to embrace us. And when God called, her “Yes” was clear enough to create the conditions for the possibility that God would save us. May we follow her in life, through death, into the life to come – all through the untold grace of her son Jesus Christ. This entry was posted in Sunday Morning and tagged Assumption, assumption of mary into heaven, assumption of the virgin, Blessed Virgin Mary, Caracci, franciscan, Mary, Solemnity by Friar Musings. Bookmark the permalink.